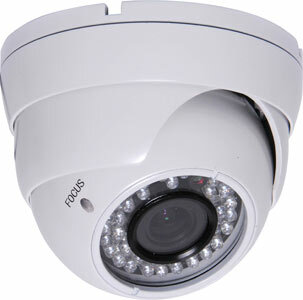 This CCD dome camera is housed in a vandal resistant weatherproof IP65 aluminium case. Lens has an adjustable focal length (2.8-12mm). Specifically designed for installation where damage resistance is paramount eg bus or train stations, concourses, carparks etc. 3-axis bracket allows wall or ceiling mount. 30m infra-red coverage. This camera is equipped with a Sony CXD4141GG Effio-V chip which is designed to offer superior performance when combined with 960H sensors. Effio-V equipped cameras offer drastically better performance in regards to noise, dynamic range, low light conditions and high contrast situations.